My most recent knitting project… tiny little sweaters for our tiny little dogs. I discovered years ago that, for them, I can’t just make smaller versions of the sweaters that always fit our Lhasa Apsos and Shih Tzus so beautifully. 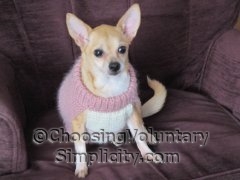 Chihuahuas have a completely different body shape… and scrawny little necks and relatively big chests… and it’s amazingly difficult to knit a sweater that actually “fits” their little bodies. But I keep working at it. 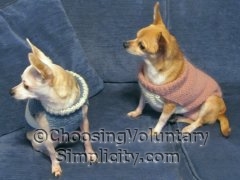 I have never been very happy with any of the sweaters I have knit from patterns because the fit of the neck has never been right for these dogs. So now I am knitting sweaters without a pattern, and these sweaters are a much better fit. I need to determine a neck size that won’t be too tight but will be tight enough to keep the sweater from sliding off those non-existent shoulders. I’m working with a main body piece that goes over the back from the base of the dog’s tail to the top of the neck, and a smaller and shorter piece that fits from the throat and over the stomach. 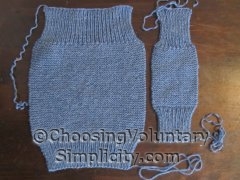 I sew the two pieces together leaving “arm holes.” Both pieces are knit straight, and the number of stitches and the length and width of the pieces is determined by each dog’s measurements, so this pattern idea could be used for a dog of any size. This has been strictly a trial and error procedure because the dogs actually have to wear the sweaters for a while before I can see what happens with the neck. I have been decreasing the neck size with each subsequent sweater, but I can see that I still need to make the neck smaller. I’ve been knitting all the sweaters using only simple ribbing and garter stitch, and luckily the sweaters are tiny, so they don’t take much yarn or much knitting time. And I’ve been using up odd lots of yarn that I had left over from other projects… including a couple of never-finished afghans that I unraveled. 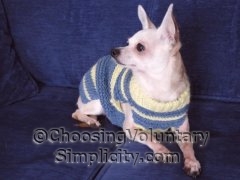 The sweater that fits the best so far is the one with the yellow and blue stripes. The fit of the neck in that one is almost right. Adorable! I will have to try this for my girl. 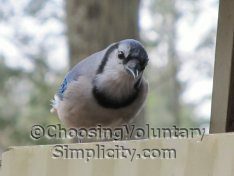 Nothing commercial has ever fit with the same problems you describe. I don’t knit but after reading this I’m wondering if I could use the same idea with fleecy fabric and sew a sweater. I like the simple shape and the way your sweaters fit. Darling little dogs you have there! What obliging little girls, modeling so beautifully. Thanks for sharing! What a great, fun, and unique way to use up left-over yarn. I am sure your tiny dogs appreciate having something so nice to help keep them warm.